As the agency works to advance an array of big projects, ONC is also focused on reducing documentation and quality reporting burdens for providers. 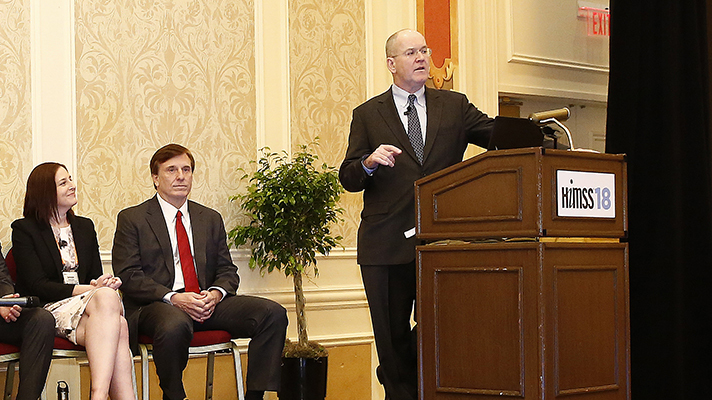 LAS VEGAS – The Office of the National Coordinator for Health IT has always had a tightrope to walk as it works to nudge along digital innovation and data exchange – requiring vendors and providers to up their game without being too burdensome in their rule-making. At the HIMSS18 ONC Town Hall on Tuesday, eight officials from the federal agency offered updates on its work on a number of issues – rules and certification, standards and technology, privacy and security, precision medicine and, especially, interoperability – while getting feedback from a packed house of health industry stakeholders. The operative word in ONC's name is "coordinate," and the agency has its work cut out for it these days as it continues in its mission to achieve the "shared vision of getting patients empowered with electronic data" and broadening the applications of IT to "change some of the operational dynamics of the American health system," said National Coordinator for Health IT Donald Rucker, MD. "At this turn of the political cycle, we've had well over 100 meetings," he said, and there's been a major investment of time and energy to help move the needle as ONC pushes big projects such as its own draft Trusted Exchange Framework and Common Agreement, manages the mandates of the 21st Century Act, advances the aim of the Precision Medicine Initiative through its Sync for Science project and more – working alongside an alphabet soup of other agencies: NIH, CDC, FDA, VA, AHRQ. At the same time, Deputy Assistant Secretary for Health Technology Reform and former four-term Louisiana Congressman John Fleming, MD, said the agency is also keenly focused on the individual physician practice, and committed to reducing clinician burden. "We feel that we need fewer regulations, rather than more," he said. "The top-of-mind issue we're dealing with today is documentation guidelines," said Fleming. "You may recall they were created back in the '90s, when we were just thinking of using electronic health records. And they were well intended: You get paid for how much you documented. "I suppose that did work back then, a little bit," he added. "But what happened was that when electronic health records came along, the ability to copy and paste, to check boxes and to fill in a lot of data in general exploded. So today, the provider who is inputting information into the computer has to think about how much that reimbursement for that work is going to be. It's based not on work but on documentation." That leads to some physicians documenting dozens of pages of dubiously valuable notes, with "a nugget of real information, that is buried, camouflaged, really, in just normal comments," said Fleming. "And it's a problem on the other side, where that other provider is trying to read that information and can't decipher it. So we're working with CMS to streamline that." The second area ONC sees a growing burden is in the "measurement and reporting of quality, and what is the quality of that quality?" he said. "That's an existential and rhetorical question, but it's important for us to determine now because we've got rules coming out of MACRA that create both a carrot and a stick when it comes to reimbursing physicians." The third area of focus is on pre-approvals – "pre-certification for anything from medication to imaging to tests," said Fleming. "A lot of work needs to be done there, and we're working on it." Physicians have a lot to think about these days, and ONC is committed to helping them make the most of technology to do their jobs well, he said. "Another area that's over the horizon but coming at us rapidly is the opioid epidemic," said Fleming. "Providers need to access accurate databases so you don't have patients getting narcotic medications from more than one provider and the other not knowing about it. We need to find a way to build that technology into the workflow so the provider can go there and not have to log into a number of different databases to see that information."